VMedia Home Phone Goes Mobile! We are excited to introduce our new VMedia Phone Application — now available for both iOS and Android devices. 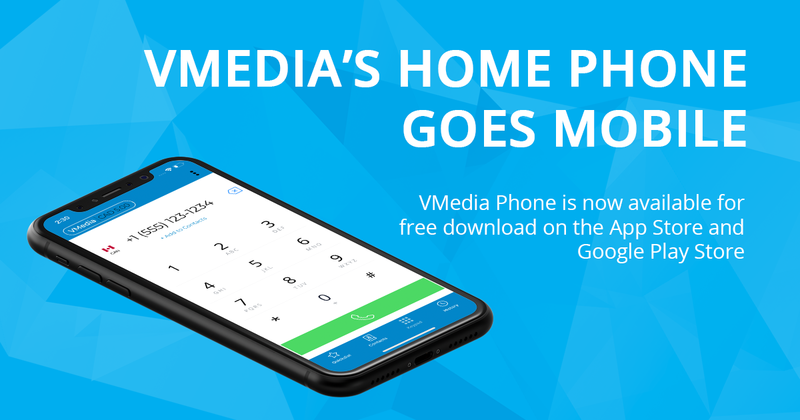 We have been working hard to bring you more, and VMedia’s Home Phone app helps you get the most out of your VMedia Home Phone subscription. The VMedia Phone app extends your VMedia home phone service to your smartphone. Now, whether you’re at home, in an uber, or just taking the dog for a walk, you will always receive your calls – all you need is our app and a data plan or Wi-Fi connection. Both iterations of the app come loaded with all your favourite Home Phone features, including Call Display with Caller ID, Voicemail, Conferencing, Account Balance and more. The app also has advanced smart phone functionality including contact integration, so you can add your existing contacts to your favourites. Our Home Phone service now brings you even more value for less. With the option to use our mobile app, you no longer need to purchase a handset or adaptor for your VMedia Home Phone service. We’re excited to be helping you save even more on long distance calling charges while staying connected. The VMedia Phone app also enjoys the same unlimited calling and long distance benefits as the Home Phone – from anywhere in the world! No costly long distance, no painful airtime, and no roaming charges. We are as always committed to providing a better and more affordable customer experience. Search for VMedia Phone in both Apple’s App Store and the Google’s Play Store to download the free app and never miss a call again!